The store has been updated so that it looks much better than the older store. It is more sleek, pleasing to the eye and more functional. The buttons have been smoothened and the menu bars have been give the web 2.0 effect. The social media integration has been improved. There is a button next to each product to like it in Facebook or tweet about it in twitter. The Store itself now has integrations with your Facebook, Twitter, YouTube and eBay accounts. If you have a Facebook account, a twitter account, a YouTube page or an eBay store, all you have to do is put the link to them on the control panel and they will automatically show up on the homepage and on the store pages. Just put in your Google Analytics code and the Online Store will start showing Analytics reports on your Google Analytics Dashboard. Do you use campaign monitor as your email provider. 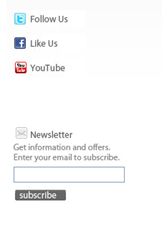 If you do, the newsletter section can subscribe visitors directly into your campaign monitor account. You can choose between a flash slider or a jQuery slider on the front page to promote your products. Having jQuery slider means that your store is 100% visible in iPhone and the iPad and your mobile customers can buy products using their mobile devices. We have improved the PayPal integration so that you only need an email address to start your online store making it quicker and easier to set up. You can also accept payments via credit cards through the PayPal integration making it more safe and secure for both yourself and your customer. Are you a web analytics company? Do you want to know how many websites are using your software? Do you want to know how many websites are using your customers software? How do you competitors rank with you in the top 10, top 100, top 500, top 1000 for any country in the world? Do you offer products and services around web analytics? Do you have integrations with web analytics platforms? Do you want to only approach companies who use a particular analytics platform? Do you want to sell your services to companies who use the platform that integrates with you? If you answer yes to these, you might be interested in our analytics platform that analyses analytics companies usage. We will soon be releasing a tool that allows you to find out what analytics provider a website is using (any website in the top 100,000). Stay tuned for more details. You don’t want to track everyone who lands on your website. Define that online segment who have the highest chance of conversion. For us, Melbourne and Sydney visitors are our target market. What is conversion for you, be clear with that. Then build some goals around the conversions. It might be selling a product, subscribing to a newsletter, downloading a whitepaper. Then build some goals around your conversion metrics. Put call to action buttons/links on all the pages. Make sure that every customer knows how to buy a product from you, or to subscribe to your newsletter or to download that whitepaper whatever conversion is for you. Create the segment of your target market in Google Analytics and use that to track your metrics. Google Analytics have just released the beta version of In-Page analytics. This tool helps your visualise user engagement on your website visually. This report is similar to the overlay report but adds multiple layers of depth and customisation to your reports. The report shows the percentage of clicks against any link and when you hover on top of it, it will show the clicks, goal value and a breakdown of all of your goals. In-Page analytics supports image maps, advanced segments, and also outgoing links. Click through your whole website while in In-Page analytics mode and try and determine what paths users take. Pick your front page (or your most popular landing page) and If you look at the top percentages on each page and follow that path, you are following the most popular path that visitors take on your website. 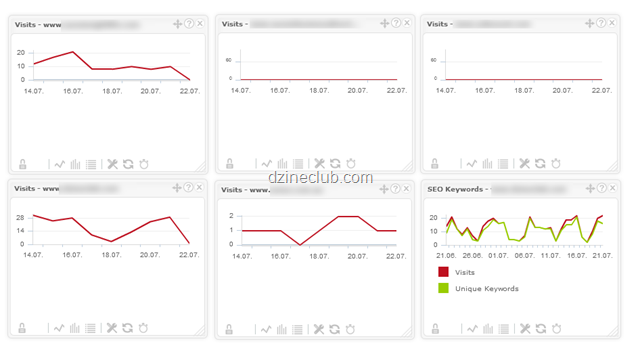 Have a look at how clicks affect on pages depending on where a visitor is. Click on the top right and bring down the advanced segments and see how your segments interact with your website. Do new visitors tend to click on about us more than returning visitors for example. You can also view any advanced segments that you have created on your Google Analytics account. You can click on + Add Filter to filter a subset of your visitors for better analysis. What actionable information does In-Page analytics provide? Keyword Conversion Tracking – What is it? The most important stat for a website is conversion. A conversion might be a purchase for an online store, a filled enquiry form for a services company, a whitepaper download, etc etc. Keyword Conversion tracking helps you understand the most important thing that contributed to that conversion. The keyword that the visitor put into the Search Engine, landed on your website or microsite and triggered a conversion event. These are the visitors that are doing conversion on your website. Lets look at how you can track this. Lets have a look at a customer conversion lifecycle. What you have at the Traffic stage where most of the data gets analyzed is a lot of noise. At this stage, you have visitors coming from multiple sources, referrals using multiple keywords. When Visitors land on your page, some bounce back. Some move into research stage where they are consuming the information. Once satisfied, some visitors will move into a consideration stage, and with the right information in front of them eventually move into a conversion stage. This is where you want to track what your users searched for to eventuate the conversion. You need a fairly robust analytics solution to track Keyword Conversion. You need at least Google Analytics or Piwik Web Analytics at the free end. At the paid end, you get more robustness, flexibility, analysis and offline data analysis through platforms such as Adobe SiteCatalyst powered by Omniture, CoreMetrics or WebTrends. Please view our post on the list of Web Analytics Platforms for more information on these providers. So now you have the data! But what do you do with the data? Similarly, you need to start tracking your source and your Referrals for best way for conversion. DzineClub Web Analytics Implementation and Consulting services can help you gain these insights from your otherwise flat ordinary reporting and help you really evaluate your business. Using these information you will know where to invest in moving forward. We’ll look at how we can solve the first issue on this post, being hard to access. Google Analytics has a great way of setting up alerts and scheduling of sending reports that makes it easy for you to access data. The problem with things being sent to you is that you are not motivated to view them. For me, my analytics reports land on my inbox once every 2 weeks and I barely look at them. What I really do to view what my visitors are doing is use custom applications that read analytics data and I can access information that is important for me through these. Here are a bunch of applications on iphone and Adobe Air that you can use to keep track of your analytics. 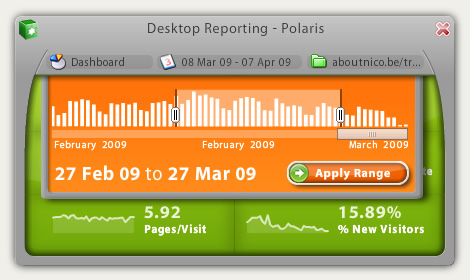 Polaris is a cross-platform desktop widget for Google Analytics. With 8 standard reports it’s the easiest way keep your data always instantly available. The rich interface and swift navigation make it a pleasure to use. Trakkboard allows you to compare and view reports on single or multiple Google Analytics accounts form one dashboard. You do not need to log into Google Analytics and can create multiple dashboards for the data you are comparing. 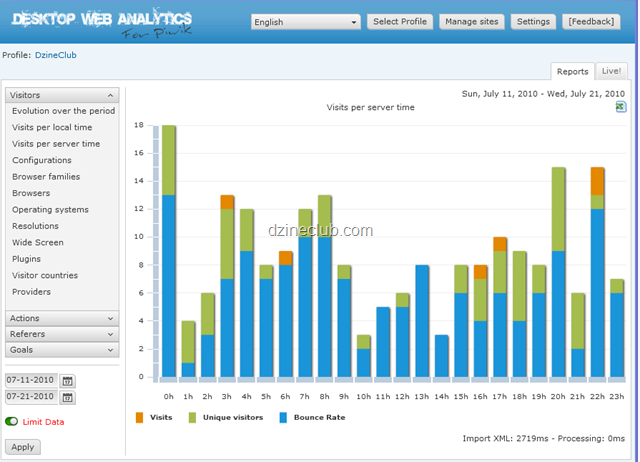 If you use Piwik Analytics, Desktop Web Analytics for Piwik is an amazing app to visualise your analytics. You can set up multiple profiles so that you can view multiple analytics accounts. There is also a live tab where you can view what users are doing live on your website. How many times someone has clicked on your email link (in contact us) compared to how many emails you have received. If you have a high number of clicks, but a low number of enquiries, it might make sense to create a contact us form and use that instead. You can essentially track if you are sending a lot of traffic to your affiliates and if you are, and if they are turning into sales or enquiries, you should charge commission on that traffic. Even your general outbound links (such as maps, review sites ) etc, you can track them to see if any of your investments are turning into action for you. Want to get more intelligence from your website and use that to improve your business? Our staff have recently been certified as Google Analytics Qualified Individuals. That means that our knowledge about Analytics matches the requirements set by Google themselves. One of the things we had to do to get the Qualification was complete Conversion University that takes you through all the ins and outs and setting up of a good Google Analytics system on any site. The test was fairly hard with 70 questions and 90 minutes of time. We would not recommend doing the test unless you have read through the university slides at least a few times and can remember code snippets as well as set up information. Want to implement or improve your Google Analytics? Advanced Segments in Google Analytics are very powerful. This allows you to drop your website visitors into separate buckets/segments and view reports around those particular segments. An interesting fact for us was that our Australian Returning Visitors segments browsers were majority of Firefox and Chrome browsers. So we can assume that they are a bit more tech savvy and we can provide content which could be a bit technical. The dashboard contains all of your custom reports in one location. When you set up your account, it automatically has the main reports on the dashboard already. You can remove the ones that are not relevant to you and you can add any report you like that are more important for your particular business. 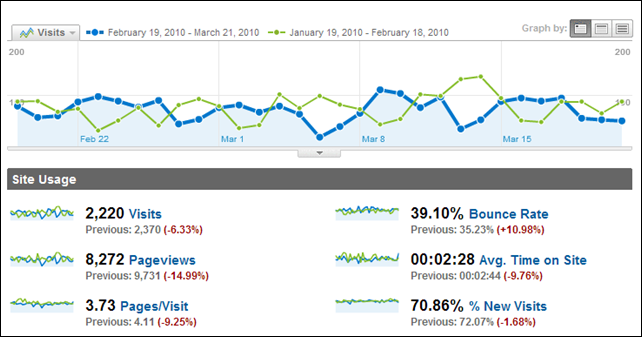 Dig deeper when setting up your dashboard and compare past results on your reports. They say 🙂 a picture tells a thousand words. A quick visual guide into where the visitors are coming from. The map overlay can go deep into suburb/city level. Tell how many users went to your quote, contact us page and how many completed.